Enter to win a Nexxus Therappe Shampoo & Humectress Conditioner set, part of the newly reformulated Nexxus New York Salon Care #NewNexxus. You know I love the start of a new season to adjust my beauty routine and check out new products. I plan on giving my hair a little rejuvenation too of course, and with the newly reformulated products from Nexxus New York Salon Care, it should be easy to do. Each Nexxus system includes a regimen to meet a specific hair need. I can&apos;t wait to get my hands on the improved Nexxus Therappe Shampoo & Humectress Conditioner, and try the new Encapsulate Serum. The regimen is enriched with 100% Elastin protein and Caviar Complex, formulated to rebalance, restore, and replenish hair so it&apos;s more soft, nourished, and manageable. Concentrated protein and precious ingredients for hair with beautiful fluidity? After a LONG winter, this is exactly what I need! 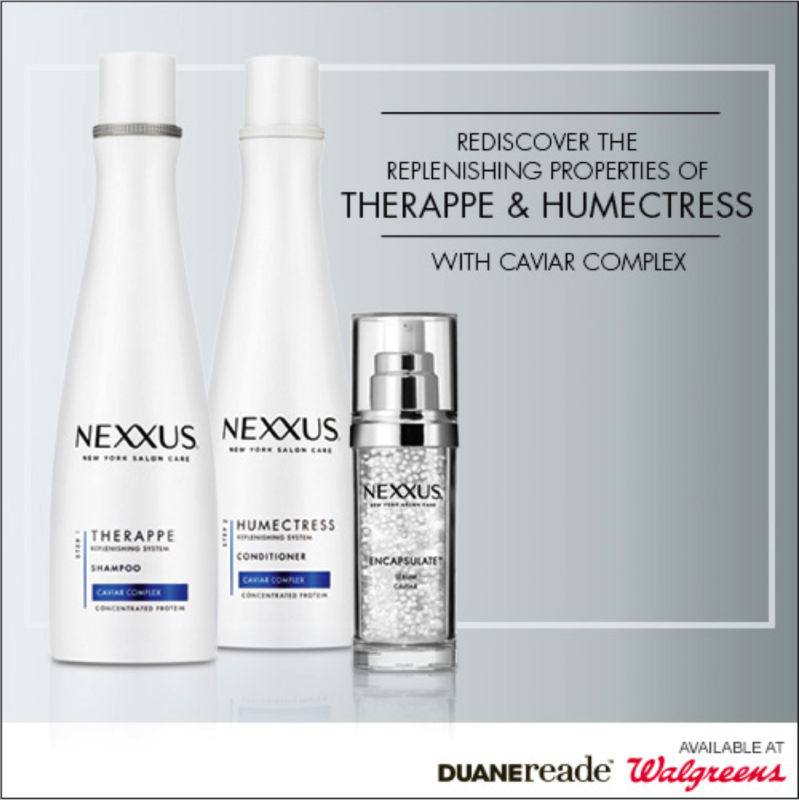 If you were lucky to enough to stop into your local Walgreens or Duane Reade during the April Beauty Must-Haves event to try New Nexxus Therappe & Humectress with Caviar Complex this week, you may have snagged a $2-off coupon on all your favorite Nexxus New York Salon Care products. Use the coupon until 6/24/15 on any one Nexxus New York Salon Care product and pop in anytime for the latest beauty must-haves. Follow along on social with the hashtag #NewNexxus for great hair care convo, product offers, and more. WIN IT! I If you&apos;re interested in trying the reformulated Nexxus line, I&apos;m happy to offer one reader the Nexxus Therappe Replenishing System Silicone Free Shampoo and Nexxus Humectress Replenishing System Conditioner ($30+ value). TO ENTER: Please leave a comment below! Simple as that. You must be at least 18 years old and a US resident. We&apos;ll choose a winner in one week. Good luck! This post is sponsored by Lunchbox #Ad.